One of the disconnects holding teams back the most in an organization embarking on an Agile transformation is the lack of will and perhaps understanding of vision on the part of the business. The required shift in thinking is from a “push system” to a “pull system”. 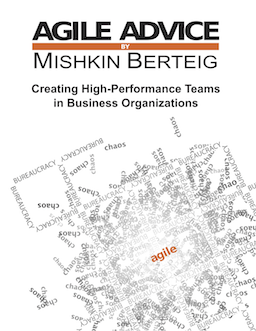 Historically and still culturally, most organizations, even those claiming to be ‘Agile’ are very much push systems. The business folks in client services – VPs, Directors, sales people, etc. seem to make time (deadline) commitments to clients on behalf of teams and then the teams are given the deadlines to finish the work. Sometimes, the deadlines are decided on in consultation with particular individuals on the teams and very rarely, if ever, with the actual teams themselves. In any case, the fact that the business is almost entirely deadline-driven is the centre of the push system. Deadlines push or drive everything else. Deadlines are fixed and often considered non-negotiable. Deadlines are a taboo subject – it is considered a waste of time to even discuss them because they just don’t and won’t ever move. The general attitude is that if we try to move deadlines, we put the entire business at risk because our clients will drop us and turn to one of our competitors who claim to be able to promise and keep deadlines. If we lose our clients, we lose business, we lose money and it potentially puts us all out of jobs. What this exposes is not only a push system driven by deadlines, but a culture that is actually driven by fear. The not-so-implicit message is that if you miss a deadline, you might lose your job, so you had better do whatever it takes to not miss the deadline. Or else. Push and pull systems and mentalities are like oil and water – they don’t mix. In Agile, there is no place for fear of failure. Rather, teams must be allowed to fail (miss deadlines) and learn from their failures (plan better). The “make the deadline or else message” is couched and clouded by other talk. The main excuse is to blame the client, as noted above. “That’s just the way our clients work, the way the market works”. Of course, such an excuse contains a kernel of truth. Without a true understanding and embrace of Agile, the idea of not meeting deadlines and the perceived consequences can be truly scary. Generally, there is an understanding from the business that the productivity of teams may drop somewhat as they progress through the storming stage. What this translates into is a difficult discussion with clients around delayed delivery. It is tolerable in that it is temporary. “Once the teams get up and running, we can go back to meeting our deadlines, and even be able to deliver early because Agile is supposed to be faster.” But the benefits of truly adopting Agile are much more powerful than this. What needs to be understood is the true business value for investing in Agile processes and practices – how it may add cost and time to the initial development Cycle, but how it saves both the business and the client tremendously on technical debt and support long-term. This needs to be understood and championed by the business in order for the organization to become liberated from its enslavement to the push system mentality. At the heart of such a mental liberation is the wholehearted adoption and commitment to the Agile/Lean principle that quality is non-negotiable. The investment in Agile processes and practices is essentially an investment not only in quality, but in continuous quality improvements towards the goal of being able to frequently deliver products of increasing relevance and quality (value). The ability to ship frequently allows for sustainable growth. All of this is made impossible by the deadline-driven push system mentality/culture of fear. One of the first things that a team needs in order to focus on continuous quality improvements is slack so that it can learn to learn. The first goal of the business leadership should be to facilitate scope and deadline slack for the team. This goal should also be fully and visibly championed by the business leadership. In order to develop the capability to facilitate slack, the business needs to gain knowledge around the purpose and importance of Agile processes and practices and be able to articulate a strong business case for them. The business leadership needs to develop the skill of educating the team, management and business leadership on the long-term benefits of an Agile transformation – the transformation from a push system to a pull system. The key stakeholders and business leaderships need to possess the courage to engage in difficult conversations with management and clients who may be upset by the short-term pain of delays and missed deadlines and protect the team from continued attempts to push work into the team. Perhaps above all, the business leadership needs to develop an attitude of learning – a humble learning posture that allows for the setting aside of preconceived notions, fears and prejudices around what it means to be a good business leader. A leader possessed of this posture demonstrates a learning attitude by stressing first and foremost the importance of creating slack for the team to learn to learn. It is a common pitfall for inexperienced business leaderships and stakeholders to expect Agile to provide solutions for their push system woes, woes that include the broken trust of clients from consistently broken (unrealistic, dreamt-up) deadline promises and the crippling effects of technical debt (the fallout of the former – when scope, time and cost are fixed, quality is compromised). If the business leadership, with the support of the Process Facilitators and the Transformation Team, is able to foster the organizational will to create slack for the teams, then the teams will have the space they need to truly focus on continuous quality improvements. This is a critical milestone on the path to realizing the true, measurable benefits of Agile. Although the support of others is needed, the business leadership is in a unique position benefitting from an intimate relationship with both the needs of the business as well as the daily life of the team. The first way that the business leadership creates slack for the teams is by championing the process. In OpenAgile, like all other Agile methodologies, there are key features of the process the purpose of which are to give space for new teams to begin to make the often seemingly inconsequential, yet ultimately critical first steps towards continuous quality improvements. One of the most obvious of these features is the Agile team meetings. In the early stages of team development, organizational understanding and will, the OpenAgile meetings (particularly the Reflection and Learning aspects of the Engagement Meetings in OpenAgile) can easily be discounted as an obstacle preventing the team from getting the “real work” done. What is often forgotten under the pressure of deadlines is the fact that in order for a team to be able to learn to make continuous quality improvements, it needs to develop the capability of systematic (frequent & regular) inspection and adaptation of the way that it works. It is easy to save on the short term pain of perceived non-negotiable deadlines (meeting deadlines at all cost = success) by compromising on investing in the process, especially when the team is still learning to learn and the effectiveness of the meetings is not yet apparent. When the team and the organization have an expectation of Agile as something that fits into the push system and allows for a team to function better within such a system, it can be hard to understand how spending time in a kind of meeting that the team doesn’t seem good at yet can be of any value. This is where the business leadership needs to stand firmly behind the process. The team needs the meetings – the space to reflect, learn and plan – in order to learn to become more effective at making continuous quality improvements – a critical feature of an effective pull system. Without the meetings, the team will never develop this critical capability and as a result, will never become an Agile team. Instead, the team will revert back to getting the “real work” done with all of the quality problems crippling the organization and which led to the decision to adopt an Agile framework in the first place. Another key feature of the process for the business leadership to understand and champion is the concept of burn-down as represented by the burn-down chart of an Agile team. Agile doesn’t care about how much work the team gets done. It assumes that the team is doing valuable work and getting things done – in other words, that the team is managing itself and working towards its goals and commitments. There are no tools in Agile for an individual, least of all the business leadership, to measure and manage how much work the team is getting done. Agile acknowledges the reality that real (sustainable) productivity cannot be forced on any team. Instead, a team grows its productivity at a sustainable pace when it is given enough slack to do so. The team makes a plan at the beginning of the Cycle based on what it understands about its capacity, works towards that goal throughout the Cycle and hopefully delivers valuable results at the end of the Cycle. By learning to apply the process of continuous improvement, quality and productivity go up hand in hand. That is the essence of the pull model. Through all of this, the team manages “how” it gets work done. The productivity of a team can be measured, but the burn-down chart is neither an appropriate nor effective tool for measuring the productivity of a team. Instead, burn-down provides one specific measurement and ONLY this one measurement: WORK REMAINING (in order to achieve the goal/commitment of the current Cycle). It does not and cannot tell you how much the team got done and even less so the whys and hows of the output and productivity of the team during the Cycle. So what is the purpose of burn-down and why should the business leadership even care? If it can’t be used as a tool to measure the productivity of the team (in other words, if it can’t be used to manage the team) then what importance can it possibly have? These are typical questions of teams and individuals that are coming from a traditional project management, i.e. command & control, i.e. “push” system mentality. Understanding the purpose of burn-down depends on the ability to make the shift from the push system paradigm to the pull system paradigm. In a push system, burn-down is nice but somewhat irrelevant. For an organization committed to an Agile transformation (towards a pull system of self-managed teams) it is an invaluable launch pad for powerful conversations that live at the heart of continuous quality improvements. When a team decides on a plan for a Cycle of work, the plan is a commitment. This is a critical step in the Agile process. It is only after a unanimous commitment from the whole team that the team begins to work on the plan. If any individual team member feels hesitant about the work in the plan, tasks and potentially even Value Drivers should be removed until everyone is comfortable making a commitment. When the business leadership is telling a team what the plan is, then it is not the team’s plan and therefore it cannot be a team commitment. This is not only an inappropriate use of authority, it is also breaking the Agile process. Moreover, when a plan and therefore a commitment is forced onto a team, the team cannot be held accountable for failure. Worse yet, the team will never learn to plan. If a team is not able to plan, then it is not able to make commitments. If the team is overwhelmed by an overly-ambitious, management-forced plan, it will not learn to evaluate its capacity and apply that knowledge to long-term planning and project estimates. It will not learn to make meaningful quality improvements and reflect on its progress. It will not learn to self-manage or self-organize. The purpose of burn-down is to establish commitment velocity. In other words, the amount of work that the team can truthfully expect to complete during the Cycle when it is making the Plan. The difference between the number of tasks in the Cycle Plan and the number of tasks remaining at the end of the Cycle gives the team its commitment velocity. Commitment velocity is always based on minimum historical velocity. The team uses commitment velocity to make a Cycle Plan containing no more than the number of tasks represented by its commitment velocity. This allows the team to spend just the right amount of effort and time on planning and allows the team slack to focus on the truly Agile work of learning and continuous quality and process improvements. Over-planning, especially when it is wedded to over-committing or even worse, non-committing (a common push system mentality pitfall forced onto teams by the business leadership) leaves the team in a state of dependent on daily micro-management and can completely halt the progress of a team. Not to mention that this is a flagrant violation of Agile values (truthfulness, responding to change over following a plan) and principles (sustainable development). Such compromises to foundational Agile values, principles and processes may produce desired results in the very short-term, but the long-term costs can be crippling to teams and organizations. The wasteful activity associated with team dependency on micro-management is what often leads organizations to the accumulation of technical debt that places them in dire competitive disadvantage and desperate need for Agile transformation in the first place. If an organization misses out on this golden opportunity, teams can become demoralized and innocuous to the Agile practices and the promise of an Agile transformation can quickly erode.